QRSS speed / performance tests. Argo with its preset modes has been a boon to the LF DXing enthusiast as it is so easy to set up. Argo can be set to display QRSS modes from 3-second dot-length up to 120-second and its parameters are pre-set to make the most of each speed. During the Trans-Atlantic tests stations have necessarily stuck to one speed at a time so it has been difficult to compare the performance of different speeds under real conditions. Would a loud signal on 60-second dot mode equate to a poor signal on 10-second dot mode for instance? Another factor that has been talked of is the possibilty of a normal speed CW contact. How much louder would a signal have to be to make it on CW? During a quiet afternoon in March I ran some tests with Alan G3NYK who is about 220km from me. He ran his screen grabber and I was able to adjust the transmitter power to produce the appropriate "O" copy on Alan's Argo screen. The problem initially was to reduce my transmitter output enough for the QRSS60 test. In the end I reduced the PA Volts to zero (switched off the PSU) and relied on the feed-through power from the driver stage of the mosfet PA. By this means I reduced the output to a measured 500mV pk-pk on the 50 Ohm feed to the ATU. (about 600uW). 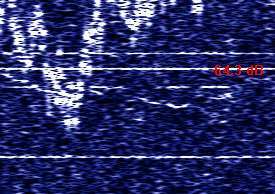 It just shows how effective QRSS is! 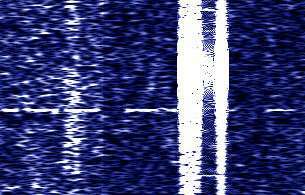 At this level the QRSS60 signal looked like this. We don't know who that was firing up just above me but you can see the end of the "Y", most of the "X" and the beginning of the "M" of my callsign. Without the interference that would just rate as an "O" copy. Alan was adjusting the gain to get best display which is why it looks brighter on the left. Alan then switched his Argo to 10-second mode and we tried again. This time I needed 1.25V pk-pk (3.9mW) to get the "O" copy. Here you see the "X" with a sproggie drifting through it and a plain "M". We next tried QRSS3 mode and discovered that I needed just over 3V pk-pk (23mW) to get a clear copy. Due to incompetence on both our parts, and the fact that a QRSS3 screen whizzes past pretty quickly after looking at QRSS60, we failed to get a screen grab of that but we aimed at the same kind of copy we had on the other two screens. Finally Alan put the CW filter in and I sent some 12wpm CW whilst twiddling the PSU Voltage. I was surprised just how much more power I needed for Alan to get a good copy. He does wish to point out that he's no CW DX operator though! The figures for CW were 12V pk-pk or 360mW. Those dB figures are calculated from the original Voltage readings. Playing with those figures shows us that a marginal QRSS60 signal will need a power boost of 27dB or more to make it copyable on CW. On the other hand a really solid QRSS60 copy would probably be quite readable as QRSS10. I appreciate that the theorey suggests a bigger advantage for the slower modes than we found here. All I can say is that's how it came out in the wash, make of it what you will! Dave Pick G3YXM, with thanks to Alan G3NYK. Back to the Features page. Back to the LF News page.